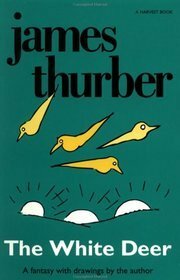 The White Deer, James Thurber, Harvest, 1945, ISBN 0-15-696264-0, $5.95, 115pp. A little fantasy story by Thurber, not silly enough to be really funny, yet definitely not a serious story, either. If it had been written within this decade, it might have had that incredibly useless label post-modern thrown on it, as Thurber was one of those writers who delighted in wordplay that acknowledges the presence of the reader. A king and his three sons–two hearty hunters like their father and the youngest a musician and poet–corner a white deer who changes into a beautiful princess. The princess cannot remember her name or family, so she sets the three sons on quests. The question in the castle is whether the princess has been enchanted to forget her name, or is she a deer that has been enchanted to resemble a princess. Everything becomes clear in the end, like all good fairy tales, and Thurber gets to have a lot of fun getting there. Hopefully, you will too. I found this to be a little too similar to the humor of Norman Juster’s The Phantom Tollbooth for me to enjoy it wholeheartedly.